TemplateHack.com - Download Elegantes premium blogger template. 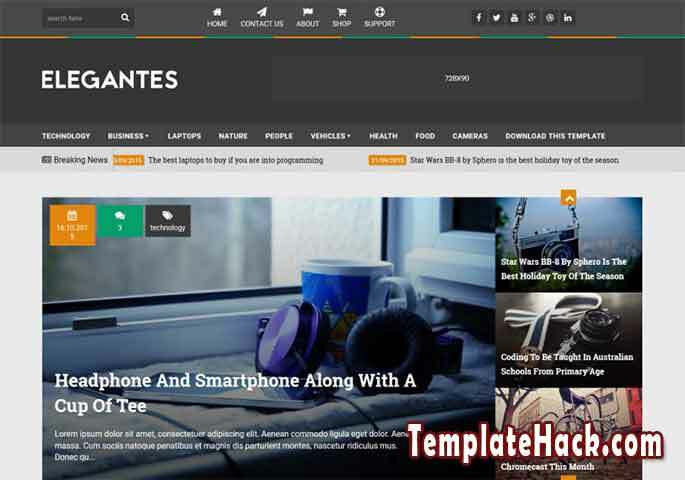 Elegantes is news magazine blogger template designed with green base color. It is haas a news ticker features inside to make your blog look uniquely. Elegantes is customizable blogspot template with SEO features to make your blog boost to page one rank on Google search engine. It will make your news post readable by search engine. Elegantes is suitable for any niche blogger topic. Download this premium blogger template from the link button below. Minimalist, post thumbnails, page navigation menu, 1 right sidebar, 2 column, slideshow, email subscription ready, 3 column footer, ads ready, green, mega menu, SEO friendly, social bookmark ready, drop down menu, responsive, mobile friendly. News blogger template, magazine blogger template, technology blogger template, tech blogger template, internet blogger template, viral blogger template, breaking news blogger template, niche blogger template.